I am so ready for warm weather and spending time outside! How about you? We are in Southern California and we use our patio a lot, and truth be told, it’s lookin’ a bit tired. A few fun pieces could brighten it right up. 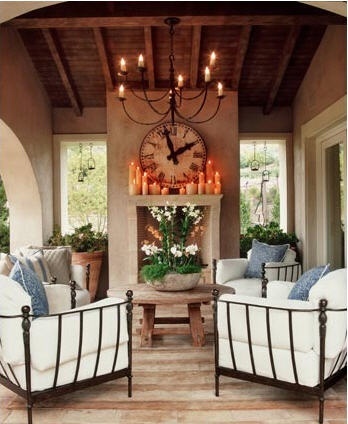 I love the soothing color palette and the way these outdoor rooms make me want to grab a book and a cool drink and just hang out. In our part of the country, square footage costs an arm and a leg, so we try to maximize every square inch of living space. Since we entertain frequently, this is extra important so that we can have more people over without it seeming cramped or crowded. 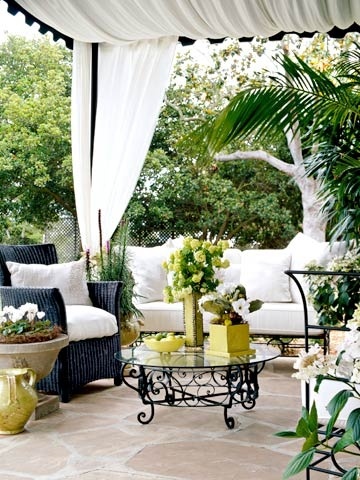 Entertaining outside is one of the best ways to do this. 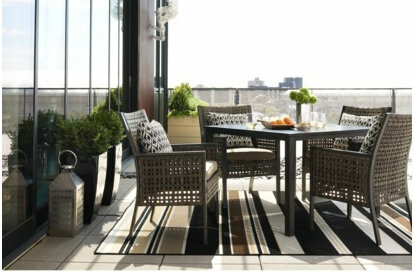 Eating al fresco is great too, and I want a new patio set. I actually think this one from Target would be fabulous. I also like hanging out in the evenings with friends and family and Target has a great selection of fire pits and propane patio heaters. We definitely need to get a new heater. Our other one is kaput! I think this one that is like a standing lamp is pretty dang cool. We don’t have a pool, but we have lots of friends and neighbors who do, and we’re about 15 minutes from the beach. I definitely need new towels. The ones we have are several years old and are getting kind of ratty. It’s time. I love the water-color painting-ish feel of these towels. And what fun patterns! Love the Surfboards, the Popsicles, the Octopus and the pretty Flower, but there are tons to choose from. (And if Handsome Hubby grabs one of these new, pretty towels for anything other than the beach or the pool, I am going to hurt him.) Honestly! My good towels are NOT for use as a dog bed or a moving blanket! I am really getting excited about warmer weather and more time outside, are you? What’s on your wish list? I love the outdoor spaces, I can’t wait to be on our deck and porch more. I might have to buy that octopus towel. It’s too cute! Love those spaces! Right now I need to spruce up my front porch. Maybe a trip to Target is in order? Those spaces look amazing!! Loving the towels, too! Thanks for sharing. I HAVE to have that popsicle towel. It is so cute!! They find some fabulous gothicky things on the Net and I was delighted they’d found your amazing floor candelabra. Sorry, I know this has nothing to do with outside rooms. 🙂 My bad! Why I felt a blue chicken was necessary. Using broken and smaller pieces of coral to create a summery, coastal look.